Actually, there were 2 things that were a toss up to do for Free-for-All Friday. One was to take some of the paintings I consider 'rejects' and give them away today. But, I went through them and they were rejects in the extreme and I just couldn't bring myself to even give them away for free. So that idea worked in theory but not practice so they'll stay in the garage. The other idea which wasn't what I was leaning toward now looks a whole lot better. 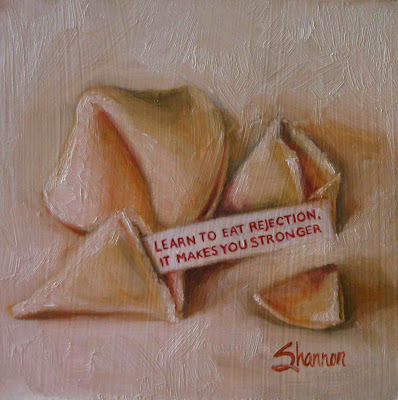 When I came across the quote "Learn to eat rejection, it makes you stronger" I just kinda had a laugh and connected with it. I've been wanting to do a fortune cookie painting for myself but the fortune I was going to use didn't motivate me as much as this. I did this little painting a couple of days ago. So for today if you'd like a little 4" x 4" computer print out on canvas or paper (whichever one ends up looking best) then post a comment that you'd like one. This time I'll have to get $4 for package/shipping as these fun things can add up. Just mail it to me. And thanks for the comments from yesterday I agree with them all, though I've really never tried the batting cages idea. I see the possibilities. I'd love one! should I mail to the address on the blog? I'd love to get a copy! I'm going to have it up at my office.